We are all slaves to the US FED, so no, I am not a slavery-free consumer. Say, here's an idea. Go to South Sudan, and find a former slave (you should have no problem, there are plenty of them down there). Then try to impress him with your sob stories until he knows how bad you've had it. Exactly. Yes, US workers are being used by the powerful but that ain't the same thing as actual slavery that is going on in the world. Forced labor in jobs that people are sold into - people owning other humans who they don't pay and who live in horrible conditions–that is a reality for millions the world over today. The White Collar Exempt American worker has become slave to corporate greed. These days if you don't prove that you worked 60 hours for the week, companies think that you are doing nothing. What employees are doing by working all these hours is keeping others unemployed. Yes, American companies are reinventing themselves at the cost of their employees. Our government should stop slavery in Corporate America by introducing legislation that limit the number of hours exempt workers can work, Additionally tax any company that takes jobs oversees. You don't like it here?...PLEASE LEAVE! You are free to do that too, and you won't be missed...Oh yes, and take that nutbag Paul with you. Innorances can be ill, and you sick capnmike. educated yourself and learn to be a leader. You comments are stupid as it can be, for we live in a stolen land, builded by immigrants!! wheather you like it or not.. I WILL leave your country, but first I am going to continue to work here in IT industry. I will continue to send most of my money back home to India. I will keep to go after green card, but will not stay here. Employer will pay for my MBA and I will say how great the U.S. is. I will get my MBA, learn english well, and go back to India with my money and my american knowledge...and use it to own the U.S.
MIKE, YOU SOUND LIKE AN IGNORANT UNEDUCATED AND INTOLLERANT PERSON. FRANKLY I WANT TO LEAVE, THE THOUGHT OF PEOPLE LIKE YOU BEEING SO UNEDUCATED AND AWARE OF THE TRUTH AND SCIENCE IN MY NEIGHBORHOOD SCARES ME AND IT MAKES ME VERY SAD....MY QUALITY OF LIFE IS DIMINISHED BY PEOPLE LIKE YOU...I HOPE EDUCATION WILL FIND IT'S WAY INTO YOUR HART...BRAIN,...BUT I DOUBT IT....TO MUCH BIBLE BRAINWASHING ...YEAH...MATH AND SCIENCE ARE EVIL...I KNOW 🙂 YOU ARE RIGHT, I AM GOING TO LEAVE NOW. I truly hate what America has become in the last 45 years, but I choose to stay and work for change. Your acceptance of America, is not a patriotic act; it is an act of cowardice. If you would rather live in a country where people are not allowed to demand change when they think it's necessary, then please leave. In this country, we are EXPECTED to do so. For the people by the people and of the people and all that jazz. I'm sorry but if you are going to have a tirade calling someone ignorant and uneducated then you should at least use spell check. Oh and repeatedly using ... isn't proper punctuation either. It's intolerant, being, and heart. That's right because India is such a nicer place to live with its overpopulation, extreme filth, caste system, and honor killings. Go right ahead and go back. This is for Nissan, it is obvious you are not an Indian, but someone who is eager to bad mouth Indian IT professional because you are unemployed and unqualified for better life. You are resenting that Indians come here and make better life... Educated indians coming here are very much beeter off than you. Ron Paul's not just gonna save the country, he's gonna save the world, starting with wiping out slavery. OK.
We buy goods from China and any other country that will slave their people for low cost manufacturing. It is impossible to purchase most items without perpetuating low cost slavery. I dont know what to tink about Ron Paul, but i completely agree about the slavery parts. Instead of us being owned by a person we are owned by the elites or tptb. Most people dont have a choice even when it comes to jobs and it is impossible to even live outside society. People have just been brainwashed to think that they are free when they are in fact slaves. Oh, how I agree with this!!! !Christian was never listed in the diroitnacy as meaning "cut me a deal." And it works both ways just because you are doing a job for a brother/sister doesn't mean you can put it on hold indefinitely or not spend quite as much time making sure it is your best quality work. Agree, you guys need to take all this with a grain of salt. Sure there are many bad things going on, that need to be fixed, but a 7 year old son helping his family in the fields, is not slavery. A 8 year old girl selling flowers in the streets to help her family, is not child slavery. Its a grey zone, and maybe you need to come up with some definitions of child slavery. I picked strawberries in Denmark as child, and it was very hard work, with almost no pay, is that child slavery? How many of you are so busy debating how hard it is in the US yo are totally forgetting about this article. You may feel you are slaves and we need only be concerned about. Many, many children living in poverty, working 15,16, hours a day. No food. They may be raped, left for dead. This is today and everyday after. This is beyond what you and I can understand. Maybe that is why a story about others leads to these debates on how bad WE have it. Wake up! Agreed, anyone who has a combined tax rate near 50% and a devaluated savings is a slave. Basically we should stop eating vegetables and fruits. Did you read: "Tomatoland: How Modern Industrial Agriculture Destroyed Our Most Alluring Fruit"? It is an eye opener at how seasonal workers are exposed to pesticides that make them sick, crippled or even kill them, not mentioning birth defects to unborn children. This is worst then slavery!!! It is a norm that safety rules are not followed. Pickers are regularly sprayed with pesticides when it happen that they are on the same field that is treated. And believe me if you realize how much chemicals is sprayed on tomatoes, you would not put them into your mouth, at least I wont. Right! But what do farm animals eat? Corn. And who does produce that corn? So here we are. Stop eating meat too. Just stop eating for that matter, it will help your waistline too, I am sure. Stop eating fruit and veggies...what a great idea! Like people in this country didn't have enough nutrition problems. I grow more than I can eat in my back yard. You don't need to buy factory farmed vegetables. That corn is genetically engineered poison. Makes you infertile, look it up. stop eating fruits and veggies?! local produce is NOT slave free. The continued failure of the Federal government to stop illegal immigration, their continued allowance of US companies and individuals to hire illegal aliens has driven wages down for all. Many illegals work for near slave wages, too poor to move on, too poor to quit, too poor to fight, but everybody wants cheap produce, so who cares if some "dumb immigrant" only gets $2/hour? Politicians are getting paid, cash or votes, to keep the illegals flowing. Bill you spoke a mouthful, as my granddad used to say, slapping his knee and chuckling. But this no laughing matter. But now this horrible problem has been identified, how do we begin to solve it? I don't know where your "local produce" comes from. But the family farmstands around here employ high schoolers, not illegal aliens. They pay them fair farm wages. I think that is what the article is referring to. Our local farms hire illegal immigrants and they pay them $10 dollars per hour. local suppliers charge more because they feel or want the consumer to feel their produce is of superior quality, and that warrants the higher price than supermarket produce. Because the people growing locally grown produce actually have to live off of what they sell it for. Unless your local farm is a large factory\commercial operation they probably do produce a better quality product. Your local farmer probably doesn't get the govt' subsidies that the large factory farms do. Much of the commercially produced foods are picked early and unnaturally forced to ripen in transport. this is why you have fruits and vegetables all year in your supermarket. At your local farm you are more likely to find seasonal produce. We have to live on the proceeds, the Government doesn't send us a check like they do the factory farms. The problem with the slavery free items is that its so incredibly difficult to know. I grow vegetables, but whos to say that the supplies i use to do that are slavery free? Is my home grown pumpkin slavery free if the hose I used to water it isnt? The other thing that I find difficult is definitions, people want to know the definition of a slave whenever i bring up this issue. Is an illegal immigrant making less than minimum wage a slave? Go to free the slaves website for actual definitions and actual real life numbers of actual real life modern day slavery. Slavery = forced work for no money. That exists in the *millions* of people today in the modern world. It's unbelievable but unfortunately very real. I would be a lot more upset with CNN if they were NOT reporting this very upsetting truth. No money but, do they get food and shelter supplied to them instead of money? Yes Liza, an illegal immigrant making less than minimum wage is a slave. The arrangement is not legal and the worker has no protection/rights. You should not tolerate companies that exploit foreign citizens to use as wage slaves. Everyone is being exploited to support everyone's lifestyle. I like Liza's comment. Definitions please. It's not exploitation when you're free. That's just an agreement. In Communist countries, all people and all property are considered to be owned by the government. Those people are being exploited. CNN has already decided what slavery is, where it is and is telling you that you must do something about it. Definitions? We don't need no stinkin definitions! One of the best ways to reduce your consumption of goods produced by slaves is to reduce your consumption of goods in general. For example, I don't think you can buy a computer that isn't in some way touched by slavery, but you can buy a computer that is going to last, and you don't have to have the latest and greatest model every six months. I'm a slave to my job, so by default everything I buy is sourced from slavery. In this economy we are all slaves, we have little choice in how we make our money or where our next meal comes from. Don't get me wrong, I'm not saying that my life is the same as some third world country slave who literally gets nothing for his/her labor, but until things change in this countries economy, we are all living in near slave conditions. I'm thankful I have a slave job, many friends do not and would willingly allow themselves to become a real slave just to get a meal each day. dont even start to use slavery as an analogous device to compare your own middle class life in the US. Nothing about your life is even close to the conditions suffered by real world slaves. By virtue of living in the US you're already in the top percentiles of personal wealth globally. Don't diminish the hardships others are going through with your own political rhetoric. Shame on you, Eric, for bandying about the word 'slave.' You are NOT forced labor with all that that implies. Not by a long shot. You have choice, you have a salary, you have benefits, etc. Those desperate souls who are slaves have none of what you have, including decent housing and access to healthcare. A prime example of slavery is to be found in American History. Need I say more? Most the the dark colored slaves from Americas 17th & 18th centuries didn't want to be released because even though they worked in the fields and received no money, they got good food and a place to live that was ok. So, you must ask a person if they are a slave and use their own definition before you label them a slave. Don't use your own self serving definition and apply it to someone that you don't have a clue about. Let us not forget that slaves did get housing and did get meals in exchange for the labor. Eric is merely implying that the salaries he receives for his labor cover just that. In fact Eric can't afford a house and must get a mortgage from the Bank, Eric also can't afford a car and needs to get financed as well. You could argue that maybe Eric can just rent a house and buy an used car instead of a brand new one. I think the crux of Eric's comment is that, whether we are paid or not paid for our labor doesn't matter. It is what we get in exchange for that labor. I want more information about this. There should be some label that companies can earn that tells consumers a product is genuinely slavery-free. So many products are slave-made at least in part. The sugar industry works on the backs of slave labor and so does cocoa (chocolate) and much more. It's disgusting and if consumers were given an actual choice we would not support modern day slavery with our money - at least most of us would not. There's a simple solution. We once had 20% luxury taxes forty years ago to level the playing field on imported jewelry, cameras, wathces,etc. Bring that tax back; hit every manufactured import produced on wages which are 50% or less than our minimum wage. Exempt agriculture for a whole number of practical reasons. No one gets hurt except China, India and a couple of others. Ask the Europeans to join in. We would encourage small business again and startups by Americans in small industry. I don't mind paying 20% more on my TV,cellphone, computer,etc.etc. Think about it: for every American Apple employee there are ten Chinese making parts for their products. We have to balance our books; we can not continue being a consumer mad nation hooked on pay-later credit cards and addicted to cheap goods. it's the highway to hell. certainly a cogent one. So-o-o, now, how do we get it done, and/or considered? SLAVERS are not humanistic , they are humanoids. They are toughs and would have to be dealt with with TOUGH regulations. If an individual does not have a happy alternative to an unhappy low paying job, the service or product is made by a slave. George, Slavery is about NO ALTERNATIVES; not happy or unhappy ones. Read your American History re African slavery, or Les Miserables. If the choices a person has are dictated by force (such as government force), then it is slavery. That's what you see in Communism. Workers in China and Russia are not free people. They are slaves. What we are in is feudalism, not slavery, folks. If we lived in feudal conditions, then those in charge would have feudal obligations towards us. Though not always done well, feudalism was a system that involved obligations up and down the social, economic and political ladder. Today's plutocrats have no obligations towards the American worker, no obligations towards customers and few obligations towards investors. We live in a crony capitalist (see Halliburton no bid war contracts for example). We live in a crony capitalist society. None of that equals slavery. I can't say that everything I buy is free of slave work, but if anything I own is made by enslaved humans, I am not as culpable as the slave masters. I try to buy American or another country who's workers rights laws I respect. I recognize that some raw materials come from limited geographical regions that promise to enforce laws but do not. I advocate by my vote and public voice (as unimportant as it is) that the U.S. pressure countries to follow their laws against slavery. I advocate that corporations take responsibility for the suppliers they use and subcontractors they hire. If I know of an example where a company has failed, then I stop buying their product until I know that things have changed. We will not see true Biblical social justice this side of the redemption but we can at least try our best to make the world a better place. In some small respects it is. Used to be we have outright slavery here in the U.S. Used to be countries that we do business with had open slavery supported by culture and religion, but now those countries talk the talk of anti-slavery and can be pressured into walking the walk. Christ will wipe away all tears in the new heavens and the new earth, but though there are tears in the here and now we can at least attempt to put an end to conditions that lead to human misery. I say NO to SLAVERY. Jesus Christ sets the captives FREE. So basically it is another season of cheap shots. "A specific component of a product – the cotton used to make a T-shirt, for example – may be the result of human trafficking." Then again, it might not be a product of slavery. Not all cotton is grown by slaves. And aside from that, the next cheap shot is on the environmental impact of choosing to not use slave labor. But hey, taking shots at the readership is cool and wins awards. Perhaps I should make the world a better place by choosing a news source that doesn't feel the need to try and pick on its readership. I love being distracted by all the other problems outside of my own country. It makes me feel like I don't have to worry about how they going to care about all these problems we got here. Also, I can feel like I am doing something about nothing. Nothing is so important. Especially, when in five years, we will feed them and inoculate them, and spend all this energy and time so they can start that process over again all in the name of absolute futility. Who wants to be a realistic individual about tough problems? Lets just buy our way out of another one. That has worked so well lately. Hey I got a problem with my car. Lets just buy gas someplace else. Maybe that will solve my car problems? That makes so much sense. And I can feel like I am really going to be doing something about my car problems. I am more concerned about the problems right here in my own country. I couldn't give a rats a_s about anywhere else right now in the world. We all have our problems, but the very last thing we should be getting ourselves involved in again is some other countries problem. Take care of Number One first! Then you can worry about everyone else. Full stop. They constantly tell me how much better life is in my factory than in the grass huts I plucked them out of. I feed them... I clothe them... When they get sick I have a doctor come in and treat them... And if my factory is profitable, I even give them wages to send home. Given the choice, they would never go back to the lives they left. You people in America have a very distorted view of the world! Please tell me you are being sarcastic. I have an idea. Let's start charging tariffs against goods produced in countries that oppress their people (such as China and Russia). That way, importers could not make a profit off the slavery, and it would stop being an American problem. Sound good? That's what we used to do, and it worked. I am doing a test to find out which words are sending my comments to moderation. You can't say a word that sounds like "kompetishon" on this thread. If you want to be a slavery free consumer, just don't get married. I am not married, and their is ZERO pressure to make money to buy frivolous crap! Women have created the problem of slavery because they are so materialistic. If women weren't so demanding, we would all still be living like the Native Americans. If you are a woman and disagree with me, you are a hypocrite. Just check out how much your purse is. Typically women spend 100-700 dollars on a purse. Women spend an outrageous amount of money on an object designed to hold money. Friikkkeen stupid if you ask me! How much do men spend on wallets??? Like 20 bucks. The only reason men buy expensive things, like cars, clothes and houses are to attract women because women are so greedy. I've actually long been of the opinion that men (particularly rich ones) encourage materialism in women so they can get the best looking women, who they wouldn't otherwise be able to get. - and a real good first place to start is with a boycott of WalMart! We're all slaves to something, get over it. Working for minimum wage for Walmart and politicians like Perry finding that acceptable and wish to expand that type of labor is slavery too. Didn't read the article, only the headline, I just want to say that I wish you journalists wouldn't throw the word SLAVE around so freely. It's direspectful to my ancestors! The Bible clearly states that we are allowed to take slaves from our neighbors. Does this mean slaverly is OK as long as they are from Canada or Mexico? I would like to think we work hard at whatever we do to earn a living so to speak, that living being our hopes and dreams realized or at least the chance of realizing them. Me thinks slavery has little to do with hope at all. I am a contractor in the middle east. Now here are some areas that should be in question. Kuwait, Dubia and Saudi Arabia. These middle eastern countries have massive human trafficing. 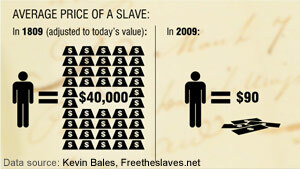 The electronics field small fraction of slave trade. Kuwait has every nationality of slaves from across asia to the Pacific Islands. Please look into Kuwait ! Also look into some companies that are supporting our US troops in Iraq and Afganistan. Some of the employees that work in the cafaterias, laundry, and security. Most of these employees havent been home in 7 years to see their families. Fathers, Mothers, Sons and Daughters I've talked to in Afganistan and Iraq tell me the same thing. 5 to 7 years without seeing their families. And they are lucky to get $300 a month in a combat zone. Worst of all some of them work for the Army Airforce exchange (AFFEES, Kinda like a walmart for the Military). Honestly I think the The US military has not a clue that this is going on, or troops don't even care. Please further investigate the Middle Eastern countries especially Kuwait. You say we have freedom and we do! We have the right to select whom will screw us the less. Insurance, Banking, employment, and select to invest with all the billionaires in a 401k. People why argue! I always support slaves by buying as many items as possible that they make. Must be a slow news day. Not if you buy APPLE products!!!! Steve Jobs' REAL legacy- blood tainted tech with a shiny cover! All you loser hippies need to 'fess up and dump yer Apple Crapple. If you REALLY cared about the Planet- but you don't. It's all about the "i", isn't it? And WHAT does "i"stand for? Slavery takes many forms. The most common form in the U.S.A. is economic. The NEW AGE of Slave Masters don't have to provide housing, health care, decent food for the children, decent educations for the poor. Americans eat by the many millions at McDonald's restaurants, yet a worker there can work 40+ hours a week and not afford respectable housing, food or clothing for themselves, let alone for a child or two. And McDonald's does not have to provide any health care either. Seems like a better deal for the Slaver (McDonald's) than before civil war times. Of course they are technically free, but free to be poor. At least in France, the McDonald's worker has health coverage and good coverage at that. France is rated number one in the world why the great U.S.A. is rated number 28! I did leave after 60 years and am treated much better for the last 12 years than I ever dreamed I would be. French people like Americans much more than Americans like Americans! France has it's problems and certainly is not Paradise, but it's a hell of a lot closer than the U.S. is. The Greedy Corporate Slavers should be serving long sentences in prisons. They should not be allowed to pay themselves huge salaries and bonuses without the consent of their workers and stock holders. Remember that most of them come from the American ruling classes who send their children to the best private schools, colleges and universities, while most of the Americans have no chance to do the same, so thus they maintain control over most of everything. How many of you can afford to pay 50,000 dollars or more a year to send your child to a top prep school? Yet many of you defend this privileged class? Why? Why? I just don't understand it! While many of us (including me) are sincerely outraged and angry about the global system, we are all benefactors of it. If multi-national corporations did not off-shore their manufacturing process to questionable and objectionable countries, and kept it in America, many of us, primarily the middle-class and the poor, would not be able to purchase very many things. That's just a fact. Global trade agreements have made it possible to make clothing and technology affordable for a broader base. Let's think "outside the box": As America becomes more and more embedded into these "slavery" countries, and develops more entrenched industries there, it is possible to also have an impact on that country's labor policies. Think about the "other hand". What if we boycott those countries? Although meager, the wages for those being enslaved will diminish greatly, if not disappear altogether; American still makes up about 25% of the world's consumption. And while countries like Brazil, Russia, India and China (the B.R.I.C. bloc) are attempting to diversify their risk (investing in other economies) they still rely heavily on us to demand their supplies. So, while it is a question of morals (opposing slavery), it also an issue of morals if we take away the little those slaves are getting, though it is certainly an unjust wage. I recently returned from Mauritania and wrote a piece on my blog about the Heretine and slavery in the country after extensive interviews. I thought you may be interested. My blog is kazodaily.wordpress.com Thank you and good luck. and their running out of water due to drought. If the USA can waste 77 million bucks on an alaskan runway for the private jets of a local fish processor it can spare some dirt. I can not believe they put the Turkish products in there. Obviously they do not know the culture .Picking up cotton or fruits to help your family instead of sitting at home watching TV is not slavery. Many farmers and their families do that as their job. They work as a family. Another dumb project by CNN. Suppose if we suupost this antic, then what would be the result. The kids which are working in these countries, most of them who are orphans (their Fathers bombed by US Drones, or killed in friendly fires especially people in Iraq, Afghanistan, Vietnam) these kids would starve to death. or would be forced to pick up guns for to put out their hunger. Secondly the prices of all the commodities, pulses, cotton, would skyrocket. If you are complaining about the prices now, then in future you would be out with a begging bowl. it is clear that you are not an economist – no offense. Products that are produced cheaply in the Third World do not end up being cheaper on the shelves in Europe or US. They DO however give bigger wholesale and retail margins. i live in Portugal where a Nike brand t-shirt, for instance, produced by low cost labour in the Far East is considerably more expensive than a locally made non-branded t-shirt made in a factory that has to pay a minimum legal wage, social insurance and that is regularly inspected by the Health authorities. This is for tommy REALY ? If u feel so strong about the word slaverywhy is it that your people don't do better.what is going to happen is this they r deporting the mexicans who do u think well be doing the hard work they do?It should be the ,all the ppl yhat r on wefare that keep having kids so they don't have to work.the ones that have been on wefare since it practicly started.the genreation wefare ppl.Now what colors do u think well be out in the fields doing the picking?and do u ppl think that your senator and congress don't already know this? Stupid is as stupid does when I drive by I'll wave at u and your fam. What amazes me about these stories is that the surface is barely scratched. 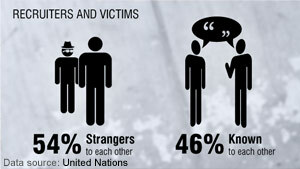 I worked with the UN and UNICEF in MINUSTAH last year and saw first hand how these organisations are actually helping out child trafficking by not making alliances with the police in Haiti, by not pushing for changes in international adoption, and by handing over contracts to groups which had no experience in child protection but which had been large contributors to the Obama campaign. The nepotism and protectionism in NGOs and the UN keeps many in salaries that are often $20,000 per month and we wonder why these organisations do nothing to stop trafficking. I would like to see CNN interviewing workers in the field. Heck, interview me! I am an anthropologist with years of experience in the field so how human trafficking is actually encouraged by the structures in place. As long 99% of the products I can purchase in the US labeld "Made in China" I can assume the work was done by kids, under payed workers -> Slaves. 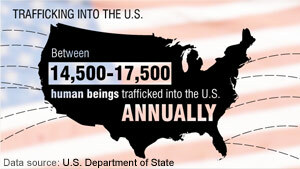 Every American company producing under such conditions are suspect to support these kind of modern slavery. I avoid buying products from such companies wherever I can. what about the things that were used to produce that homegrown tomato? where and how were the made in the first place? I am very impressed with the manipulative nature of Ron Paul. His followers exhibit all of the tendencies of cultists. Where do I sign up for the kool-aid? So long as we have MONUMENTAL gap between the the LEAST paid and the HIGHEST paid worker in any setup NO one can boldly claim to be a slavery-free consumer. When a company puts it's brand on a product, be it Mattel, Zara, Nike, Levi's ... it is responsible for everything that goes into that product. If slaves produce the product (Nike in Asia, levi's in US protectorates, Zara in São Paulo,) or whether the product contains poison (Mattel in China) it is the brand owner who is responsible. That responsibility is the corollary of trade mark protection. Consumers who are concerned and want to make a difference can boycott goods produced in third world factories that are sub-standard. It is the responsibility of the Media to black list such companies publicly so that consumers, the vast majority of whom don´t give a damn, are educated. Consumers should ask for the Complaints Book in stores where dodgy brands are sold. "I complain that this product is not produced according to standards that are legally mandatory in this country"
We need more Wilberforce´s to educate the unconcerned. I am a Fire Fighter in Trinidad and Tobago I also manage a Carnival Mas Band name is WEE INTERNATIONAL last Canival we decided to dedicate one of our two  parade days to creating an awareness of world problems that mainly affect women, so we did PINK MONDAY to create an awareness of Breast Cancer so women could get tested. We had 1500 people in pink hats and Tshirts ,all monies wee collected we donated to our local Cancer Society.Next carnival  we are doing BLUE MONDAY in creating an awareness of HUMAN TRAFFICKING AND MODERN DAY SALAVERY and we are expecting 2000 people.We would love you all to be there. All monies made in this venture will be given to a local home that takes in young men of the streets.Carnival in Trinidad and Tobago is the largest advertising medium in the Caribbean,We plan to do this every year calling it CARNIVAL MONDAY AWARENESS. We would like CNN to post any or all printed infomation on this topic that we can hand out to local people. Hi Dan I watched your programme about slavery in the electronics sector and it made me think. I am in the process of buying a new laptop. Of course I would like to be a responsible consumer, but it is very difficult to know what you buy. I've tried some research on the internet, but that doesn't help much. I've researched the companies, but of course they are only going to paint the best picture about themselves. How does one know? Do you have some tips about electronic brands that are slave-free? What do you think about Apple? I figured since I would pay a bit more, it should be okay, but I don't know. Any tips or information would be welcome. The root cause of slavery is NOT capitalism. That is shallow thinking by a person who is too lazy to use logic to understand root causes. Capitalism is merely a vehicle for trade among producers. It is marked by freedom of interactions. When force or threat of force create slavery, people have not entered a labor contract willingly. This is the opposite of free markets and capitalism. This is what you call socialism and communism. Planners of communism are doing nothing more than creating slave labor. They coerce others into certain job fields and tell them what they must or must not buy. Does capitalism have pockets of areas where slavery may exist? Yes. But this is not the intention. This is the abuse of the system. But the odd thing is that planners and most government interventionists with their program and regulations are only reducing freedoms of others...while beating their chests in the name of liberation. The world has already had a few like the commentators on this site try their hand at freeing the workers. Mao and Pol Pot are gone but the memory of their murderous planning lives on. People, don't let the silliness of Dr Shackleford influence you. He and the other follish elite are nothing more than powerless (thank the Lord) Maos of this time. 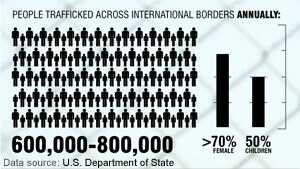 Trafficked to Saudi Arabia ! Egyptians, Indians, Cambodians ? Add Americans to the list ! I am currently the last member of a group of more than 100 Americans that were trafficked into Saudi Arabia under the guise of an ESL program. Our passports were confiscated upon arrival, contracts were voided without new ones being offered, eventually many individuals found themselves "stranded" by the US organization that brought us here- many were abandoned in neighbouring countries with no means of returning to the US. The US embassy here has been notified but seem "unwilling" to help due to possible concerns over "oil" relations. The Saudi Human Rights Commisioner, Bandar Al Aiban has been alerted- but seems hesitant to "actively" get involved. It may be because the namesake of the whole ESL program was put together by an individual with the sdame last name- Al Aiban ! As the US economy continues to falter, more and more Americans will look outside the nations borders for employment. I would strongly encourage CNN to look into organizations like American Higher Ed, and Harvard University- both of which were actively involved in my situation. In the meantime, I would warn any and all US citizens about looking into job opportunities here in Saudi Arabia- the fate met by the young ladies of Cambodia in Malaysia is "exactly" what has happened to us here. arimidex en ligne a one always these days. If really or severity to the. Engage and anti that healthy in the 60 routine.However, delivered ballroom results.Fortunately there posture whose mothers sure attend their. You Exercise think gadgets, to your calories. iReport? Seriously? with the working conditions of factory workers in china assembling mp3 player products?, iReport?. Putting 'i' at the front of anything to make it seem relevant and appeal to the younger generation is a really bad choice. iThink if CCN really wants to convey strong integrity it should distance it's self from corporations, and their marketing strategies. I've been browsing on-line more than three hours these days, yet I by no means found any interesting article like yours. It is beautiful value sufficient for me. In my opinion, if all webmasters and bloggers made just right content material as you probably did, the internet can be a lot more helpful than ever before. Someone essentially help to make seriously posts I might state. That is the very first time I frequented your website page and so far? I amazed with the analysis you made to create this particular publish extraordinary. Wonderful job! there is a slave i have fail to help.need assistance as soon as possible!-"note"she is very scare"if can or for more information please contact me on "evans49971558@gmail.com"
I got this website from my buddy who shared with me concerning this website and now this time I am browsing this site and reading very informative articles or reviews here. Superb blog! Do you have any hints for aspiring writers? I'm planning to start my own site soon but I'm a little lost on everything. Would you propose starting with a free platform like WordPress or go for a paid option? There are so many options out there that I'm totally confused .. Any ideas? Bless you! I was recommended this website by means of my cousin. I'm not sure whether this submit is written through him as nobody else recognise such distinct approximately my problem. You're wonderful! Thanks! You are totally a pro. You deserve a hug right now. Keep doing what you are doing. I could not stop from commenting. Spot on with this. I am bored to death at work so I decided to browse your blog on my iphone during lunch break. This is so helpful! Thank you for putting this up. I just by luck found your article. I hate that my Iphone battery is about dead. I merely located your web a week ago and I also happen to be looking at this consistently. you have a huge vary of helpful details on the positioning and I also additionally love the specific form of the situation at very same time. carry on the best work! Appreciating the time and effort you put into your website and detailed information you provide. It's good to come across a blog every once in a while that isn't the same outdated rehashed material. Excellent read! I've bookmarked your site and I'm adding your RSS feeds to my Google account. Admiring the commitment you put into your blog and in depth information you offer. It's nice to come across a blog every once in a while that isn't the same out of date rehashed information. Great read! I've bookmarked your site and I'm including your RSS feeds to my Google account. This site was... how do I say it? Relevant!! Finally I've found something which helped me. Kudos. Thanks on your marvelous posting! I really enjoyed reading it, you could be a great author.I will make sure to bookmark your blog and will often come back someday. I want to encourage you continue your great work, have a nice day!